Author: Bernd Heine, Karsten Legère. This ethnobotanical study deals with the botanical terms (plant taxonomy) in Standard Swahili (Kiswahili Sanifu). They are used by Swahili fishermen and farmers on the East African islands Zanzibar and Pemba as well as the coastal region of the mainland. The authors give information on the linguistic structure of the botanical terms, the sociolinguistic aspects as well as a description of several indigenous plants. Each plant is presented in detail in its use as a source of food, of building material, of medicine and of feed for animals. Emphasis is placed on wild plants without excluding cultivated plants. The aim of this study was to record Swahili speakers’ knowledge and experience of the local flora in general (folk taxonomy). While Greenway (1937) obtained his information from the different parts of Tanzania, this study concentrates on the coastal regions where Swahili is spoken as a native tongue. An introductory part explains the folk taxonomy classification with the help of diagrams and tables. 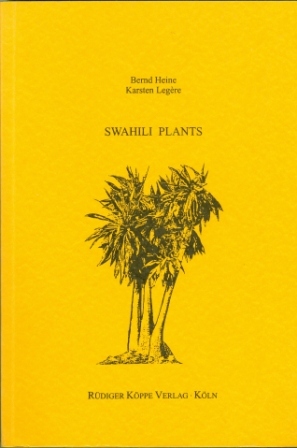 The work is an important contribution to the understanding of folk botany in Swahili. It also preserves this very useful information for posterity. Younger people know little about the environment around them, and the plant lexicon should enrich and preserve Swahili classification names.